The Bureau of Land Management (BLM) and the U.S. Forest Service (USFS) are clearing large tracts of pinyon and juniper woodlands (PJ) across the Great Basin in an effort to maintain sagebrush habitat for the Greater sage-grouse. These large, spatially replicated management treatments provide an opportunity to investigate the impacts of woodland removal on both those species that are reliant on sagebrush and those more reliant on PJ woodlands. This project quantifies how alterations in vegetation community structure from woodland removal affects avian and small mammal communities, especially those species that are dependent on sagebrush. Little is known about how many of these species use and depend on sagebrush and PJ habitat, and thus it is critical that a better understanding of how populations and communities are structured prior to, during, and after woodland removals in order to gauge the effectiveness of this management intervention for restoring functioning sagebrush ecosystems. To the extent that pinyon-juniper (PJ) removal treatments are intended to enhance regional biodiversity (e.g., treating Greater sage-grouse as an “umbrella species”), it is critical to determine whether sagebrush management actions are meeting intended biodiversity objectives. Greater regional species richness can increase resilience to changing environmental conditions and provides a buffer against variations in productivity as a consequence of environmental fluctuations (the “insurance hypothesis”). While it is clear that expanding conifer canopies result in substantial decreases in local plant species richness and abundance and that removing or thinning PJ often results in reversing those decreases, less is known about the broader regional effects of PJ removal on wildlife communities. Even for avian communities, which are among the most well-studied wildlife taxa, the impact of PJ removal on many bird species is not yet well-known. For some species, such as the Gray Flycatcher (Empidonax wrightii), Sage thrasher (Oreoscoptes montanus), Sagebrush Sparrow (Artemisiospiza nevadensis), Brewer’s sparrow (Spizella breweri), and Green-tailed Towhee (Pipilo chlorurus), PJ removal may improve nesting habitat and thereby enhance fitness. On the other hand, PJ woodlands can provide critical habitat for many bird species. For example, Pinyon Jay (Gymnorhinus cyanocephalus) and Loggerhead Shrike (Lanius ludovicianus) populations may be reliant on tree nesting sites and open woodland habitat. 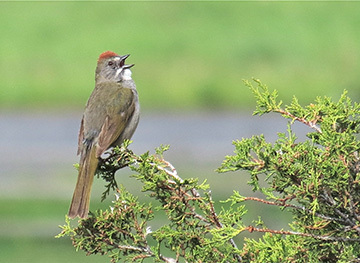 In some cases, landscapes that include PJ may exhibit enhanced regional bird diversity. In the Great Basin, natural plant communities and habitats have been degraded over the last 150 years by from livestock grazing, mining, agriculture, water diversion, altered fire regimes, invasive species and recreation. Small mammal communities are particularly at risk from habitat fragmentation caused by this degradation, with a high potential for local extinctions in fragmented landscapes given their small home range sizes and poor dispersal abilities. Currently, we do not have baseline information on habitat associations for multiple small mammal species in Nevada. By determining preferences for shrews and other under-studied small mammals among sagebrush, ecotone, or phase 2 and 3 (denser tree cover) PJ habitats, we can better predict how thinning projects will affect their populations in the future and influence management plans with the necessary knowledge to conserve them under these threats. Furthermore, monitoring mammal species in addition to birds will allow us to examine the effects of PJ removal on species that perceive and use the landscape across a wide range of spatial scales. Although our survey methods are designed to monitor a broad diversity of avian and small mammal species, the team will target three small mammal species and seven bird species. Relatively little is known about the habitat requirements of the target small mammal species. Despite being found in a diversity of Great Basin habitat types, both shrew species are rare and likely tied to specific (yet unknown) microhabitat characteristics within arid sagebrush systems and associated riparian meadows. The targeted bird species vary in their use of sagebrush habitats, and while more is known about their habitat use than the shrew species, their responses to PJ clearing remains unclear. To understand the effects of PJ removals on these species, the team will expand upon a recently funded study aimed at studying the effects of PJ removal on bat, lizard, and insect communities in regional project areas across northern Nevada (Sheldon NAR, and BLM and USFS land near Austin, Elko, and Ely), while also adding a fifth area where both shrew species have recently been detected (Vya). Proposed work expands the taxonomic focus of the already-funded project to include two more groups of species (birds and terrestrial mammals), many of which also rely on insects for food. Thus, providing a much broader picture of the ecological impacts of PJ removals on a diverse community that is connected through structural habitat requirements (e.g., nesting, basking, and hunting sites) and food resources (the insect community). Determine the specific habitat requirements of rare and less-studied species (e.g., Merriam’s shrew, Dark Kangaroo Mouse, Gray Flycatcher, Sage Thrasher, Sagebrush Sparrow, Brewer’s Sparrow, Loggerhead Shrike, Pinyon Jay, and Green-tailed Towhee), specifically with regards to varying levels of sagebrush and PJ cover. Determine the effectiveness of PJ removal projects in restoring sagebrush habitat that supports specialized sagebrush-dependent species as well as other species typically found within healthy sagebrush communities. Awasthi, A., Singh, M., Soni, S. K., Singh, R., & Kalra, A. (2014). Biodiversity acts as insurance of productivity of bacterial communities under abiotic perturbations. The ISME journal, 8(12), 2445-2452. Bombaci, S., & Pejchar, L. (2016). Consequences of pinyon and juniper woodland reduction for wildlife in North America. Forest Ecology and Management, 365, 34-50. Cornely, J., Carraway, L., & Verts, B. (1992). Sorex preblei. Mammalian SpeciesArchive, 416, 1- 3. Gibson, L., Lynam, A. J., Bradshaw, C. J., He, F., Bickford, D. P., Woodruff, D. S., ... & Laurance, W. F. (2013). Near-complete extinction of native small mammal fauna 25 years after forest fragmentation. Science, 341(6153), 1508-1510. Gross, K., Cardinale, B. J., Fox, J. W., Gonzalez, A., Loreau, M., Polley, H. W., ... & Van Ruijven, J. (2014). Species richness and the temporal stability of biomass production: a new analysis of recent biodiversity experiments. The American Naturalist, 183(1), 1-12. Hafner, J.C. and N.S. Upham. 2011. Phylogeography of the dark kangaroo mouse, Microdipodops megacephalus: cryptic lineages and dispersal routes in North America's Great Basin. Journal of Biogeography 38(6): 1077–1097. Johnson, K., Smith, J., Petersen, N., Wickersham, L., & Wickersham, J. (2013). Habitat Use by Pinyon- Juniper Birds in Farmington BLM Resource Area 2013 Final Report. Johnstone, C. P., Lill, A., & Reina, R. D. (2014). Habitat loss, fragmentation and degradation effects on small mammals: Analysis with conditional inference tree statistical modelling. Biological Conservation, 176, 80-98. Loreau, M., Naeem, S., Inchausti, P., Bengtsson, J., Grime, J. P., Hector, A., & Wardle, D. A. (2001). Biodiversity and ecosystem functioning: current knowledge and future challenges. Science, 294(5543), 804-808. Miller, R. F., Svejcar, T. J., & Rose, J. A. (2000). Impacts of Western Juniper on Plant Community Composition and Structure. Journal of Range Management, 53(6), 574. Morris, L. R., & Rowe, R. J. (2014). Historical land use and altered habitats in the Great Basin. Journal of Mammalogy, 95(6), 1144-1156. Naeem, S., & Li, S. (1997). Biodiversity enhances ecosystem reliability. Nature, 390(6659), 507- 509. Paulin, K. M., Cook, J. J., & Dewey, S. R. (1999). Pinyon-juniper woodlands as sources of avian diversity. In Proceedings: Ecology and management of pinyon-juniper communities within the Interior West (SB Monsen and R. Stevens, Comps.). US Department of Agriculture, Forest Service, Rocky Mountain Research Station P-9 (pp. 240–243). Rickart, E. A., Rowe, R. J., Robson, S. L., Alexander, L. F., & Rogers, D. S. (2011). Shrews of the Ruby Mountains, Northeastern Nevada. The Southwestern Naturalist, 56(1), 95-102. Schwartz, M. W., Brigham, C. A., Hoeksema, J. D., Lyons, K. G., Mills, M. H., & Van Mantgem, P. J. (2000). Linking biodiversity to ecosystem function: implications for conservation ecology. Oecologia, 122(3), 297-305. Shanafelt, D. W., Dieckmann, U., Jonas, M., Franklin, O., Loreau, M., & Perrings, C. (2015). Biodiversity, productivity, and the spatial insurance hypothesis revisited. Journal of theoretical biology, 380, 426-435. Shonfield, J., R. Do, R.J. Brooks, and A.G. McAdam. 2013. Reducing accidental shrew mortality associated with small-mammal livetrapping in an inter- and intra-study analysis. Journal of Mammology 94(4): 745-753. Sieg, C. H., & Forest, R. M. (1991). Rocky Mountain juniper woodlands: year-round avian habitat. US Department of Agriculture, Forest Service, Rocky Mountain Forest and Range Experiment Station. Yachi, S., & Loreau, M. (1999). Biodiversity and ecosystem productivity in a fluctuating environment: the insurance hypothesis. Proceedings of the National Academy of Sciences, 96(4), 1463-1468.